Baltimore is such a major music hub on the East Coast that it’s not unusual for several tours to come through on the same night and merge together to form a single show filled with groups from different places. This is exactly what happened last Tuesday at TheDepot Baltimore, as Napalm Raid, Mother Brain, Department of Correction, and Organ Dealer all ended up in the city on the same night and play music that’s well suited to being on the same bill. It was an evening full of short, intense sets from a slew of noteworthy bands and more than enough reason to go out and do something on a Tuesday night. Uncle Buck was the only local band on the bill and they were also the ones that provided the PA for the evening, as there wasn’t a sound guy working the board and the groups were messing with the levels themselves before and during their sets. I’m not sure how long the powerviolence/grindcore duo has been around, but based on their previous show list it seems like they first started playing live somewhere around the fall of last year. They wasted little time in launching into their set, as guitarist/vocalist Bj Ramsey simply said “We’re Uncle Buck, and we sound like this” and then they started playing. If you’re familiar with any type of powerviolence or grind then you likely have an idea of what these guys sound like, but considering how much I like that particular sound this isn’t a bad thing. There was plenty of blasting and short transitions from one song to the other, and Ramsey had one of those vocal pitches that was extremely gruff and reminded me of the same style that bands like Haymaker have. It’s one of those love or hate pitches that’s so low pitched that every word seems to hit you in the chest, but I personally always like that type of vocals. Uncle Buck’s drummer Tom Scott kept hitting the kit so hard that his sticks would fly out of his hands, but rather than letting that stop him he either pulled out a spare on the spot or finished a song hitting with his bare hands. They were a little rough around the edges and there is definitely room for the two to further distinguish themselves, but this was still a really fun set to start the night off and I’d catch them again when they’re on another show. New Jersey’s Organ Dealer was the first touring act on the bill, and they were doing an East Coast run in support of their recently released album Visceral Infection. These guys play deathgrind that’s pretty equally split between the grind and death metal side of the spectrum, as they have plenty of all-out blasting sections where the instrumentals blast away and transition to new ideas constantly alongside some slower breaks that up the death metal influence significantly. What makes these guys distinguishable from some of the others that have gone for this same style is the songwriting, as they have plenty of killer riffs to grab your attention. In between the blasting and sheer weight of the instrumentation, there is a lot of substance to the guitar leads that you can really latch on to and it makes the individual songs a bit more distinguishable than I was initially expecting. This translates over perfectly live, as while Organ Dealer has only been around for about two years or so they’re a very tight live band and play off each other well. But what really put their performance over the top for me was vocalist Scot Moriarty. TheDepot Baltimore doesn’t really have a stage, as the musicians are typically separated from the crowd by a set of monitors. Moriarty chose to take advantage of this and run around screaming his head off right in the middle of the crowd, at times even jumping on top of a stack of amps off to the side of the room. I’m always into when vocalists of bands use these smaller settings to get up close and personal with the crowd, and Moriarty’s high pitched screams hit the spot. With the PA that was being used I did notice that there were some moments where his screams seemed to get washed out by the instrumentals, but after some fiddling with the levels things seemed ok and there was a decent balance between the two. Organ Dealer put on a high energy performance and their death metal/grindcore combination kept me interested the whole set. France’s Department of Correction was up next, and I had missed the last time they were in the U.S. so I was excited to catch them this time around. The band plays grindcore that’s oriented towards sheer blistering speed and some genuinely off kilter moments, sort of like a French Brutal Truth in some ways. I went in with a bit of an idea of what to expect but the group completely blew those expectations out of the water, as they delivered some of the most technically proficient and off the wall grind I’ve heard recently. Singer Grégoire Duclos performs with two mics and alternates on each one to get different pitches, which made him completely tower over the rest of the band for much of the set. Rather than having multiple vocalists handle the high/low pitches, Duclos does all of it himself and he moves between extremes with very little time in between and without any loss in intensity. But the vocal performance wasn’t the only impressive part of Department of Correction’s set, as just watching the instrumentalists fly through these super-fast technical songs had my jaw on the floor. A lot of grind tends to have a somewhat looser feel to it, as the band members play as fast as they can but everything feels like it’s on the verge of collapse at any second. In contrast, this set felt extremely tight and every single member was transitioning from one second to the next without any hesitation. It’s not all constant technical riffing and speed though, as there were some genuinely weird and off-kilter sections that gave these guys a distinctive feeling of their own and kept you on your toes, unsure of what to expect next. Like most grind sets, this one felt like it went by far too quickly and was over in a flash, but I was extremely impressed with what I saw and Department of Correction is a band I’ve been spending a lot more time with since this performance. It was time to go from one high energy performance to another, as Long Island’s Mother Brain took over shortly after Department of Correction had finished playing. The two were on tour together and this seemed like a good fit, as Mother Brain also plays grindcore with a technical slant. What was immediately noticeable was that the PA seemed like it was starting to get tapped out a bit by this time of the night, as Joe Marchese’s higher shrieks and screams had a tendency to be drowned out by the volume of the instrumentals. But this didn’t take anything away from their set, as every now and then his higher vocals would break through and when he transitioned over to the lower, guttural growls they were easy to make out. With the vocals slightly buried, much of my attention was on the guitar/drum work, and Mother Brain definitely didn’t disappoint in this regard. They had that perfect balance of technical blasting that hits as hard as possible before giving way to some mid-tempo sections that have a healthy dose of punk and sludge thrown in for good measure. This was another short set that had plenty of substance to offer, as in between the faster transitions quite a few of the mid-tempo and slow sections had guitar leads that instantly hooked me and kept it feeling like the band was always switching things up a bit. There was an overwhelming amount of energy coming from the group throughout the entire set, and while I would’ve liked the vocals to be a little less buried Mother Brain worked with the PA they had and still delivered a blistering performance. They’re another band that I’ve been throwing on quite a bit since I saw them, as they have some great riffs to offer that have a bit more substance behind them than your average grind act. North Carolina crust punk/D-beat band No Tomorrow was on the bill, but didn’t play on this particular show. Instead Mania for Conquest performed, which is a group that features members of No Tomorrow and plays a similar style of punk that pulls straight from the Discharge framework (which makes sense considering that their band name is a song from Discharge’s 1981 album Why). Immediately the venue was filled with the familiar pounding drums and extremely noisy guitar/bass work that has drawn me to this type of punk, and the group played it very convincingly. The crowd had filled out quite a bit by this point and you could tell that everyone in attendance was feeling the abrasive edges and sheer weight of the instrumentals that were on display. But as with Mother Brain’s set, the vocals were almost completely drowned out during Mania for Conquest as well. The vocalist had a much gruffer scream/singing pitch that was completely buried for the majority of the set, only becoming audible every once in a while. It didn’t matter though, and I don’t think I’ve ever said this about a live performance where you could barely hear the singer at all. The riffs were just so noisy and the energy level so high that I didn’t want the set to end, and even after all of the great performances that had already occurred these guys delivered another absolutely killer one that kept the night’s intensity going. I definitely want to see them coming back, as this particular style of punk/D-beat is something I never get sick of, especially when it’s played with the type of energy and noise that Mania for Conquest had. It had already been a long night and every group had put on an intense performance, but I knew that Canadian crust punk Napalm Raid would be worth sticking around for. Whatever issues that had been going on with the PA seem to have been resolved by this point, as I think that this set had what was probably the best sound of the night and there was a perfect balance between instrumentals and vocals. And what a damn good set it was, as the volume level jumped up significantly and Napalm Raid’s extremely aggressive riffing and pummeling drums made an immediate impression. The band played a fairly long set that covered a good deal of their discography, and this gave them plenty of time to hit me with one killer riff after another. But what’s likely to stand out to anyone that sees these guys live or listens to them on record is the vocal performance. Seriously, just go to the music section at the end of this post and listen to “Living Breathing Dead” or Drowning”. Those vocals sound like they’re coming from the very depth of Hell, and the singer is able to replicate those pitches exactly in a live setting. It gives Napalm Raid an even more intimidating and sometimes downright terrifying sound compared to some of the other crust punk bands out there, and seeing this destructive force in person was definitely one of the best sets I’ve seen in 2015. From beginning to end the set was like a tank blast to the face, and if you’re a fan of this type of angry, aggressive music then that’s exactly what will draw you in. 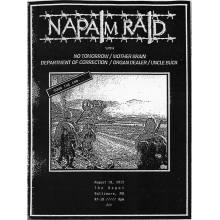 As far as tight, blisteringly intense performances go, I think Napalm Raid might just be the best crust punk band that Canada has to offer.